If it looks like beef, smells like beef, handles like beef and tastes like beef, it should be beef, right? Wrong. And it bleeds too, according to Impossible Foods, maker of the plant-based product. 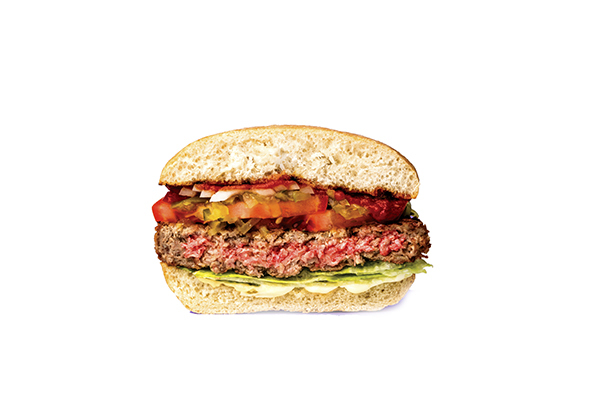 The Impossible Burger is made without antibiotics, hormones, cholesterol or artificial flavors, and is free of slaughterhouse contaminants. In addition, it uses about 75% less water, creates roughly 87% fewer greenhouse gases and requires about 95% less land than conventional ground beef from cows. The product consists of water, wheat protein, potato protein and coconut oil, while heme, a “magic molecule”, creates the flavor and smell of cooked meat. Impossible Foods, based in Redwood City, California, was founded 7 years ago by a former Stanford University biochemistry professor. The privately held company makes plant-based meat and dairy products. The company’s Impossible Burger has increased in popularity as consumer seeks more sustainable foods and is served in 1000 restaurants nationwide. Find the fake news: This article is part of the Food Safety Tech April Fool’s edition. To find out which stories are fake and which are real, log onto our site on Monday afternoon (April 2) and click on each story for the update. You can also sound off in the comments section.